Every time I see my doctor she and I go over my health then end up talking books for an hour or more at the end of her day. She and I have similar tastes in paranormal, urban fantasy, some romance, romantic suspense – and a very little mystery for her. It’s fun to talk to someone who reads almost as much as I do – but then she has 3 young boys and a full time job, so I can just barely stay ahead of her. PHEW! She also complains I don’t write enough reviews and entertains herself with my old ones. I’m not sure sure if I’m flattered or frightened by this. At any rate, I have a whole bunch of reviews for books, e-books, and e-novellas, so let’s get to it! I got tired of stating where books came from, so unless otherwise noted, I bought them or got the through a book swapping site. 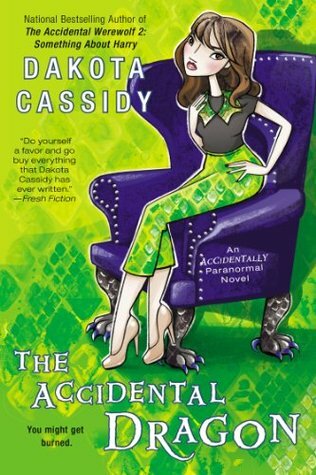 Dakota Cassidy adds to her Accidental series with The Accidental Dragon, a book that’s a lot of fun, in large parts thanks to the ladies of OOPS! who are on hand when a fireman accidentally takes the wrong vial of ‘headache’ powder – and burns down the store owned by his late best friend’s sister. Mick and Tessa somehow manage to get past the lies they were told and the fact Mick is now part dragon, and in the end Tessa’s bother’s ghost visits them to give his blessing – and ask for forgiveness for the lies her told out of jealousy. The Accidental Dragon is a classic Cassidy romp with her signature mystery element to add tension. I’d say a C+ to B- at 3.7* (the whole ‘proving it’ part with OOPS! has been played too many times) and recommended for lovers of humorous paranormal romance. 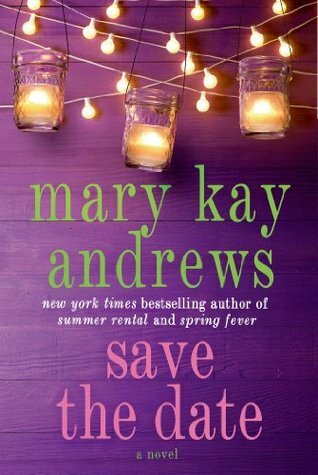 So about once a year I have this lemming like urge to jump off a cliff, which in my case is to read a chick-lit book, often by Mary Key Andrews. Save the Date was classic Andrews – mid-30’s divorced female trying to make it and prove she’s good enough, one or two controlling parents who constantly tell her she’s a failure, sleazy ex-husband, underhanded competitor, handsome man she manages to get crosswise with. Now if we had a few dead bodies, we could have had a cozy mystery, but Save the Date was just ……….. ordinary. I had this book on my PBS wish list a long time and saw the ebook on sale for $2.99 and snagged it – and read it that night. All I can say is thanks God I didn’t pay good money for the damn hard cover. A scant few hours reading and this unsatisfying bit of fluff was over and I once again wondered why the hell I thought this one would be any different. GAH! Girl Scout meeting have more unexpected twists and turns. Andrews is an excellent writer, but her plots have the excitement of a slowly moving metronome. The biggest challenge is staying awake. If you like this stuff, it’s a good example of the type. If, like me, you don’t, move along. There’s nothing to see here. For it’s type, excluding my mind-numbing boredom, it’s a C+ to B- (3.6*), but for me a D (2.0*) for dull. Give it a miss unless you’re a real fan, and there are plenty of those. If there is a God, you should be safe from more of these reviews till 20116. Semi Charmed is a book suggested to me as a good entertaining paranormal romance and I have to admit, it was – as well as one I would never have found without asking for some ideas for my friend. An indie author using Amazon’s self publishing platform, Isabel Jordan turned out a clever and interesting read with a strong female lead and an intriguing plot. If it had a short-coming, it was the ‘world’ she created wasn’t fleshed out enough. Good characters covered that, that it’s not something that stands close scrutiny. Then again, most romances don’t. Harper Hall was a seer for Sentry, an organization that slayed vampires that were supposedly abusing and killing unwilling humans. Then vamps came out and were recognized as a citizen group with rights, Sentry disbanded, and Harper was out of work. But not free of her ability as a seer. Not making enough money either since her louse of PI partner ran off to Vegan sticking her with all the bills and customers who don’t want a seer, they want a slayer. Enter Noah Riddick (and yeah, the whole Vin Diesel thing leaves him plank). The plot takes off as Harper tries to convince Riddick he and she were meant to be partners. Part fun, part serious, and a good ending – but she left some loose plot threads. I give Semi Charmed a C+ to B- (3.6*) and suggested read for those who like humorous paranormal romance. OK, I am a huge fan of this series and other than book 1, Royal Street, Suzanne Johnson has consistently exceeded my expectations. You’re expecting snark here, right? 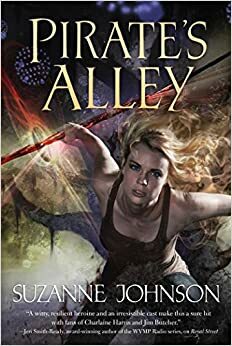 Well, yeah, Pirate’s Alley had a few flaws, but the characters, plot, and pacing were so good, I forgave them all. What was noticeably different here was the constantly twisting plot and nearly breakneck speed of the various events. The story spun out so quickly, I felt it could have used a bit of fleshing out in spots. Second – the impact of Eugenie’s pregnancy on the Elves and the whole Prete council. It consumes the plot further along and brings to a head the third major plot element. Third – The revelations of betrayal and double-crossing of Council members – and the fact the game they play might change players, but none can be trusted. But DJ isn’t exactly the same DJ from a few years ago, so she isn’t shocked and has become fundamentally suspicious of the politics on the council – especially after an order she finds wrong on every level. The way each character weighs loyalty and duty against personal feelings, and how these often conflicting demands were balanced by each character seemed to be more defining for DJ and Jean Lafitte than they were for Alex or Jake. A few other major events got short shrift in the headlong race through the ever shifting plot. Quince Randolph remains morally ambivalent character and utterly lacks the pirate’s charm and wit. Major players from earlier books are killed off stage with an astonishing lack of drama, and one changes his allegiance yet again. Historical undead Truman Capote has a clever walk on. Plus Ms Johnson added Faeries, the Winter Prince (Christof) – who seems destined for a larger role – and the Summer Prince (Florian), with the elderly queen (Sabine), their great aunt. A really good read, but not what I was expecting. Better in most respects, except for the fact I felt the author left a lot of story on the cutting room floor, so to speak – like those key character deaths. That bothered me. The small nuances that peppered her earlier books were there at the start, then faded away in favor of the relentless action. It was, regardless, a slam-bang read and the ending had some excellent twists with lots of future plot potential. DJ is maturing much as Harry Potter did, growing into her own potential. She’s a terrifically well done example of character evolution. A highly recommended series – and yeah, after this installment, still crushing on Jean Lafitte. Pirate’s Alley is more action and short on humor compared with earlier books. I give it a B+ to A- (4.3*) and highly recommended read and a MUST for fans of the series. Due to the price of both the hard cover and ebook, try and get it from the library and buy a used one/remainder for your keeper shelf as the prices come down. I suppose it was inevitable that authors would want to cash in on the popularity of Sinful, LA and it’s eccentric citizens. I just wish the authors had more talent. Bayou Bubba and Jewel of the Bayou are two completely missable novellas that make use of Fortune, Ida Belle, Miss Gertie and Banana Pudding. The character names in Bayou Bubba are painfully contrived and wince inducing. When Fortune almost pulls her gun on the annoying ‘Miss Chance’ (yes, really), I was hoping for gator food. I never did see any point to the whole mash-up mess, but it was better than Jewel of the Bayou. Talk about damn with faint praise. C- (2.7*) and give it a miss. The plot in Jewel of the Bayou is just pointless and dumb. And that’s the good part. There are some good snark examples from Ida Belle and Gertie, but damn, you need plot transplant surgery to make this worth any time – and a better heroine than Gladys. And a far less improbable ending. Skip it. As worthwhile as that stupid missing bloodstone – not exactly a best of breed. 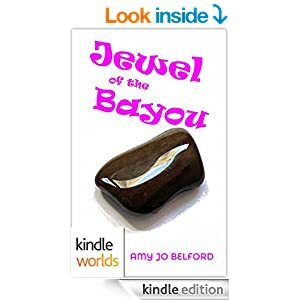 I give Jewel of the Bayou a C- to D+ (2.6*) . Both novellas are ebook only. Thank heavens no trees died for these two.